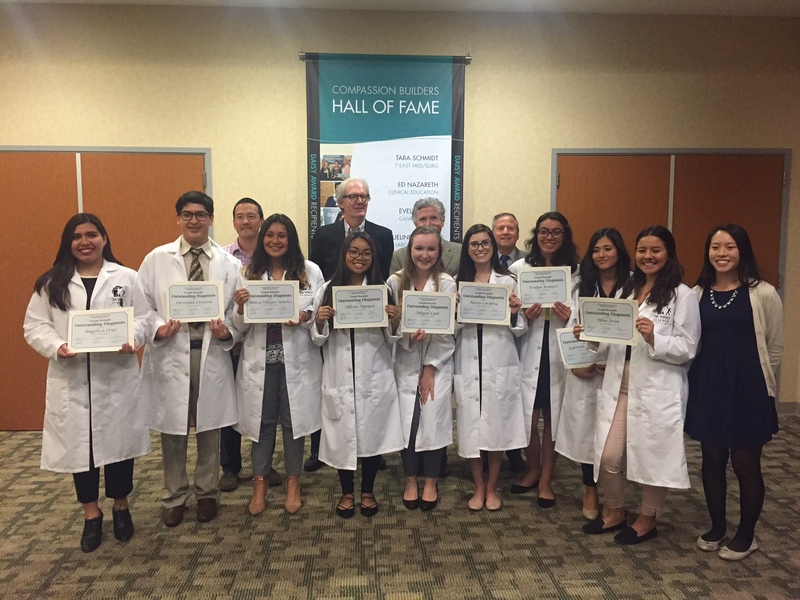 Three teams of Da Vinci Science students donned white lab coats and took part in Grand Rounds presentations before a panel of physicians at Torrance Memorial Medical Center on March 2 in connection with Da Vinci Science’s Biomedical Science pathway course, Medical Interventions. Grand Rounds are an important teaching tool and ritual of medical education consisting of presenting medical problems and treatment of a particular patient to an audience of doctors, residents, and medical students. Akin to the popular television series House, each Da Vinci team presented a case study of a fictional patient to a panel of four real physicians. The students discussed each patient’s medical and family history and their symptoms, then presented a differential diagnosis list, final diagnosis, and treatment plan. They described what diagnostic tests they would order and how they narrowed down the diagnosis list to one final diagnosis. Piecing together clues and discarding red herrings, each team came up with a final diagnosis for each patient: Intracerebral Hemorrhage, Cysticercosis, and Tubal Ectopic Pregnancy. The physicians then provided feedback on each team’s presentation. One doctor shared that the student presentations were better than some he had observed in medical school! The Medical Interventions class, taught by DVS teacher Saya Wai, is part of the Project Lead The Way Biomedical Science pathway at Da Vinci Science. The Biomedical Pathway is designed to empower students to build knowledge and skills in biomedical science through engaging in hands-on, real-world medical challenges. Following in-class presentations, the top three teams in Ms. Wai’s class were invited to present at Torrance Memorial Medical Center. We are deeply grateful to Dr. Ian Kramer, Dr. Mike Healy, Dr. Michael Liu, and Dr. John Rehm for volunteering their time to engage with and support tomorrow’s biomedical science professionals. The Da Vinci teams were comprised of the following students: Nhia Jiron, Evelyn Romero, Gabriela Romero, Christian Cisneros, Angelica Cruz, Nancy Villegas Sanchez, Abigail Cash, Alexis Cordova, and Allison Nguyen.